Nearly 60 people came to speak at Wednesday’s public hearing on removing three Confederate monuments from the Capitol Square in downtown Raleigh. Most of the speakers, who skewed older and white, said they were against moving the statues. Boyd Sturges, attorney for the Sons of Confederate Veterans, was spoke first – and set the tone of much of what followed. Sturges was referring a 2015 law that makes it more difficult to remove such statues or “objects of remembrance” – passed in response to a growing movement to move or remove Confederate monuments. 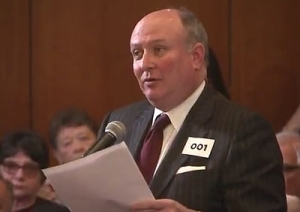 The law makes such requests the business of the North Carolina Historical Commission, whose special task force on the issue arranged Wednesday’s public hearing at the State Archives and History/State Library Building in downtown Raleigh. 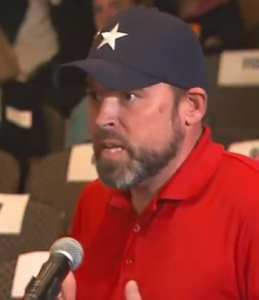 In his comments Rick New of Jacksonville represented a strain among the crowd who seemed to think the commission, by taking up the matter as they must under the law, was somehow violating state law. * The Henry Lawson Wyatt Monument, erected in 1912, which commemorates the first Confederate soldier killed in the Civil War combat at the Battle of Bethel on June 10, 1861. * The Monument to North Carolina Women of the Confederacy, erected in 1914. 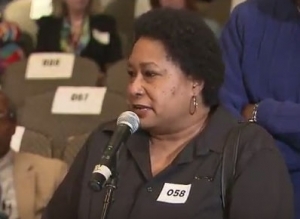 Joanne Clayton of Knightsville was one of a number of Black speakers who said they support relocating the monuments to the Bentonville Battlefield State Historic Site, as suggested by Gov. Roy Cooper. and the Jim Crow era that produced the statues. with explicitly racist language praising the institution of slavery at their unveilings – between 30 and 75 years after the war. Several speakers Wednesday made reference to the “War of Norther Aggression” and praised Southern forces who “repelled invaders,” a number of them rejecting that the war had been over slavery or racism, despite that being made explicit in Confederate documents and in poltiical speeches of that time. Others railed against “criminal leftists” and “violent communists,” with one speaker even calling Gov. Cooper “The Neville Chamberlain of our time” in a reference to the British leader blamed for appeasing Adolf Hitler. Dennis Johnson was one of a number of speakers who singled out Cooper. “I can’t believe we got a governor that would even consider that,” Johnson said of moving the monuments. Gary Williamson of Snow Camp was even more forceful, saying that removing or relocating the monuments would be erasing the contributions of his Confederate ancestors – many of whom didn’t even get a proper burial. Abraham Jones of Raleigh, another of the Black speakers who support removing the monuments, encouraged the commission and the crowd to consider what they really represent. Had the Confederacy won the Civil War, Jones said, the U.S. would not exist as it does today and it is dangerous to romanticize the cause of the Confederacy. “To continue this cause — we’ve gone on too long and it rips us apart,” Jones said. “It’s a shame. According to David Ruffin, chairman of the Historical Commission, more than 4,200 comments on the controversy have been sent through a web portal established to take public comment on the issue. He encouraged the public to continue to provide its feedback as the task-force and ultimately the full commission continues its work. The full commission will meet next month and is expected to hear a report from the Confederate monument task force. The statue of Gov. Charles Aycock in Washington will be replaced with one of Billy Graham. He is shown holding a book, not a rifle, honored for something still considered today to be good. They do not equate, but the GOP legislature that protected Confederate statues has removed the one who was not a Rebel. Growing up in rural North Carolina I understand that those North Carolinians who have ancestors that fought for the Confederacy are proud of the South standing up for what they believed in. However, what they believed in was their right to own human beings and keep them as their slaves. This is not something that North Carolina should still be praising and honoring today in the middle of our capital! The only area in our beautiful state that these monuments should be placed is at the Bentonville Battlefield State Historic Site in Four Oaks, N.C. This way they can be looked at from a historical standpoint and praised by those who wish to bask in the rich history of North Carolina. I believe that our capital should be filled with statues and monuments that are more representative of our many races and cultures. We must remember that American history is not white history. The African Americans that were enslaved in the South were just as Southern as their white slave owners. A white male was the definition of a human being for many decades in this area of the country, and as a nation we have moved away from that notion. The Union won the civil war, opening the floodgates for this long journey we have traveled in order to accept and understand the fact that all people are human. Let us move these Confederate monuments to a place of history and the past, and move forward by focusing on what we can do in the present to develop a history we can all be proud of. Let us honor the success of the Union that put an end to the dehumanization of an entire population of Southerners in the United States, let us rise together! So much has been said about the timing of when these statues were being put up — that it wasn’t right after the Civil War, but during the period of Jim Crow — and therefore they aren’t to honor veterans but are racist. And though not being from North Carolina — and none of my ancestors being honored by them — I fail to see the logic of this argument. These same types of tributes were being erected during the same time-frame in state capitals and county seats in the Midwest for Union soldiers. There is a wonderful look at Civil War monuments in Indiana found at http://www.in.gov/iwm/files/indiana_sculpture.ppt The following statement is made in this powerpoint: “The installation of Civil War monuments began to increase dramatically in the 1890s, as the veterans grew older and worked to ensure their contributions would be remembered. ” In Indiana, the last county courthouse tribute to Union soldiers was put in place in 1931. They don’t have a tribute at their capitol building, but rather a very large statue in a roadway in Indianapolis which was at first just for Civil War Union soldiers, and then encompassed all Indiana veterans of wars that had occurred. It was dedicated in 1902. In Lansing, Michigan at the Capitol building is a Sharpshooter Memorial to commemorate 1st Michigan Volunteer Sharpshooters with the Civil War authorized in 1915, a memorial to First Regiment of Michigan Engineers who served during the Civil War dedicated in 1912, and plague on a boulder dedicated to the men of the Grand Army of the Republic set up in 1912. (http://www.senate.michigan.gov/history/exploremonuments.html). The memorial to their Union soldiers at the capitol building in Des Moines, Iowa was completed in 1896. (http://www.iowacivilwarmonuments.com/cgi-bin/gaarddetails.pl?1210273429~2). When our veterans came home from the Vietnam War, they were spat upon and called ‘baby killers.’ Since then, this nation has come to the understanding that one can honor the veteran while questioning the conflict. How is this situation any different? I also have an especial reason for not wanting these statues to be moved to Bentonville. My 3rd great-uncle, John Hungerford, was killed as a Corporal at the Battle of Bentonville, dying of a musket ball on March 21, 1865 during Mower’s Charge which was the turning point of that engagement. The Illinois 10th, of which he was a part, bore the brunt of that charge, being in a corner position that saw fighting from two fronts. John Hungerford left a widow with three children. He was in his mid-forties, and had re-enlisted because of his desire for service to his country. I have visited this battlefield and it is well preserved and staffed with wonderful people. I feel quite strongly that it should be preserved just for this battle and the men who gave their lives there — like my great-uncle — and not as a North Carolina’s general remembrance for the Civil War. As Mayor Mitch Landrieu said in his evaluation of the New Orleans monuments, “there is a difference between reference and reverence” of the monuments. They should be preserved for history since they are a part of our bitter past. We cannot let it continue to be part of our present and future and linked in the minds of current veterans as essential to their esteem and honor for service in subsequent battles. They should certainly be moved for the divisiveness they cause our multi racial and multi cultural nation. We have to decide if we are better off celebrating and encouraging our diversity as a nation or if we want to move towards a white America because that is where we are heading if we talk about “fighting until hell freezes over” for structures erected with dedication speeches that promoted white supremacy. Please move these divisive Confederate monuments to a historic site away from Capitol Square.